However long I live, I cannot understand how some people can’t (or won’t) grasp this concept. Richardson, Kat: Greywalker. New York, NY: Roc, 2006, p. 185. I’d like my speculative fiction actually inventive, you know. Just like a human being is rarely reducible to one trait, yet that treatment is often used in storytelling as a shortcut, especially when it comes to characters deemed less important, like women, children, old people, or minorities of various stripes. Which is not to say that stereotypes, caricatures, or the like don’t or cannot have a place in storytelling. However, if the majority of storytelling focuses on nothing else than characters or story elements reduced to their bare bones, it’s bound to become boring and empty. There is so much more to our world, let alone imaginary worlds! Found via Martha Wells on Tumblr. Maggie and Frank belong to a team of superpowered U.S. operatives in a 1940s Cold War speculative world. Even though Maggie is the token female character, it’s really very refreshing that the author doesn’t try to shove in that bane of Smurfette stories, the inevitable romantic subplot. Martinez, Michael J.: MJ-12: Inception: A Majestic-12 Thriller. New York, NY: Night Shade Books, 2016, p. 247. Writer / director Alex Garland seems to be doing a good job on the basis of the little we see. Certainly the effects and scenery are breathtaking. And the cast looks so awesome! I’ve read the trilogy, but since it leans more towards horror than I’d like my speculative fiction to be, I’m not sure I want to see the movies. I do applaud VanderMeer’s mindfulness, though: he donates part of his royalties from the novels to environmental causes. On his blog, author Jason Sanford talks about story submission and publication data, specifically with SFF genre in mind. He refers to an essay, an interview, and his experience as editor, and talks about how men tend to submit many more stories than women, even when their stories were “totally inappropriate” (in Jason’s words). His conclusion? “In the case of why male authors are far more likely to not read a magazine or their guidelines before submitting, and are more likely to submit multiple stories in a short time frame, I think it ties in with them not seeing the motivations of others and believing all that matters is what they want. I’ve no comment on the data and survey side of the post, being a not-numbers person. What struck me was that this is the strongest-worded remark I’ve seen—and note that it really isn’t—saying a number of male authors behave in a blatantly self-centered manner and suggesting they change. Sanford, Jason. “The Submissions Men Don’t See.” Jasonsanford.com, September 24, 2017. Swedish fantasy and weird author Karin Tidbeck is giving book talks on her debut novel Amatka in the United States. “A surreal debut novel set in a world shaped by language in the tradition of Margaret Atwood and Ursula K. Le Guin. There’ll be a second book talk at New York City’s Scandinavia House on Tuesday, July 18, 2017, at 7 p.m. (free entry). On the surface it sounds a bit like Le Guin’s The Left Hand of Darkness and Emmi Itäranta’s The Weaver. The way Tidbeck talks of language ruling over matter also reminds me of the way mathematics rules over reality in Yoon Ha Lee’s The Ninefox Gambit. 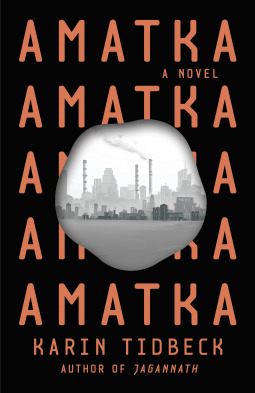 As a linguist, I’m doubly intrigued and excited to read Amatka! This post has been edited to correct a spelling error.